The O.T.C. 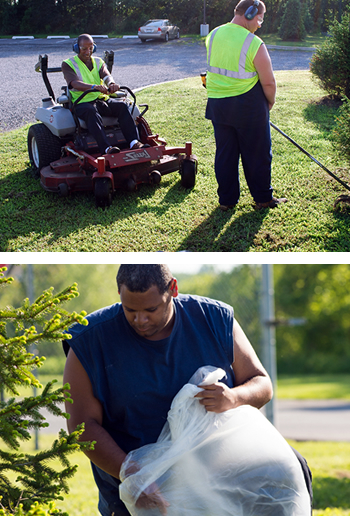 Crew Labor Program trains and coordinates mobile ground crews for basic ground maintenance and mowing for county and municipal roads, commercial business parks, and local businesses. Most of our contracts are in Burlington County, but we also provide crew labor and lawn services to Philadelphia and surrounding neighborhoods. The Crew Labor Program trains motivated adults with disabilities with the help of funding through the Division of Developmental Disabilities. Although the training program receives funding, our labor crews are completely self-sustained and are maintained by the income generated through our crew contracts. Each crew has between four and five adults with disabilities who work under the direct supervision of a crew leader who maintains high levels of safety in addition to training our workers to provide the best services possible to our clients. The Crew Labor Program not only provides these individuals with income and employment, but also provides them with opportunities to strengthen their work habits and interpersonal skills.